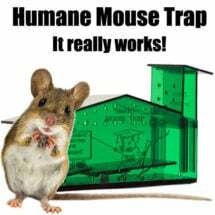 The first and only Organic Mouse Bait! The active ingredient in Agrid3 is cholecalciferol (vitamin D3). 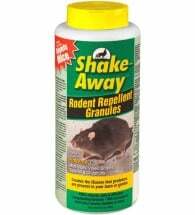 Kills rats and mice by mobilizing calcium from the bones into the bloodstream – produces hypercalcemia and death. Substantially reduced secondary hazards exist with Agrid-3 (will NOT harm pets or wildlife that eat rodents poisoned by the bait). 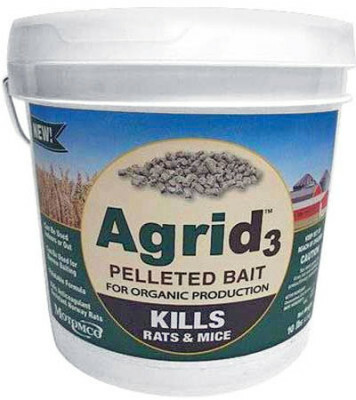 However, this pelleted rodenticide should be kept in locations out of reach from children, pets and livestock, or in a tamper-resistant Bait Station. Norway & Roof Rats: Use 2 to 8 oz. Organic Mouse Bait per placement. Space pellets at intervals of 15 to 30 feet in infested areas. 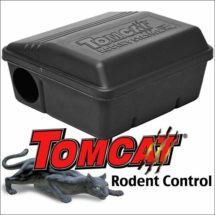 Maintain an uninterrupted supply of fresh product for 10 days or until signs of rat activity cease. House Mice: Use 1/4 to 1/2 oz. (1 to 2 tablespoons) per placement. Space pellets at intervals of 8 to 12 feet in infested areas. Up to 1 oz. may be used at points of very high rodent activity. 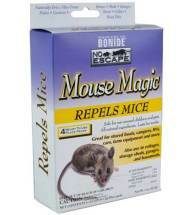 Maintain an uninterrupted supply of fresh product for 15 days or until all signs of mouse activity cease. This potent blend of essential oils provides maximum repellency and protection. This easy to apply, non-toxic formula is SAFE to use inside your home or out. Made of heavy-duty, injection-molded plastic to withstand the toughest conditions.